We don't know when the first church was built in Kirkby Stephen. But in the show case at the west end of the church, under the tower arch, you will find carved stones that date back to the time when Saxons and then Vikings lived hereabouts, between a thousand and 1400 years ago. The most famous stone, however, is not in the case. It stands in front of the pillar facing you when you enter the church. Called 'the Loki stone' it shows a bound, bearded devil who may represent the Norse god Loki. According to Nordic myth, Loki was fettered and tormented by his fellow-gods in punishment for the killing of Baldur the Beautiful. The stone dates from around 900-1000 and once also formed part of a cross shaft, though we can only speculate about the other images that once stood above and below it. 'Kirkby' means 'church place', and it is a Viking name. We can guess that it dates from between 900 and 950 - a time when Nordic people of Danish origin were spreading into the Eden Valley from the north-east and Norwegian Vikings were crossing from Ireland to settle in western Cumbria. Presumably it was these settlers that built the first church here, on the knoll above the River Eden that remains the heart of today's town. But the first mention of a church in recorded history comes shortly after 1092. People think of '1066 and all that' as the definitive time for the Norman conquest of England. But in 1066 the Eden Valley was ruled by the King of Scotland and it was not until 1092 that King William Rufus, the Conqueror's son, marched north with a large army, occupied Carlisle and the lands south of it, and sent castle-building overlords and humbler settlers "there to dwell and to till the land". The Upper Eden Valley came under Ivo Taillebois, who was already lord of Kendal, and it was he that gave the church of Kirkby Stephen together with land at Winton to St Mary's Abbey in York. Unfortunately his deed of gift (probably in 1093) does not name a patron saint for our church, and we have no other record of a dedication although both St John and St Stephen have been suggested at different times. The monks of St Mary's almost certainly built a new church in Kirkby Stephen sometime in the 12th century and certainly before 1175. It didn't last long - possibly because the tower at the crossing of nave and transepts fell down, as Norman crossing towers were prone to do. But we do have some carved stones from this Norman church, including a half-capital which Sir Nikolaus Pevsner considered the most beautiful Normal capital anywhere in Cumberland and Westmorland. It and others are now on display on the stone shelves beside the tower arch. St Mary's Abbey was, presumably, also responsible for building a new church in around 1230 and much of this survives today. Our plain but well-proportioned nave arcade, the arch between it and the south transept and most of the north transept are of this period, as are the stone seats and water basin (called by pundits sedilia and piscina) in the south wall of the chancel. Like many Border market towns, Kirkby Stephen had its ups and downs in mediaeval times, though there are few records of its destruction in Scots raids such as devastated the county town of Appleby. 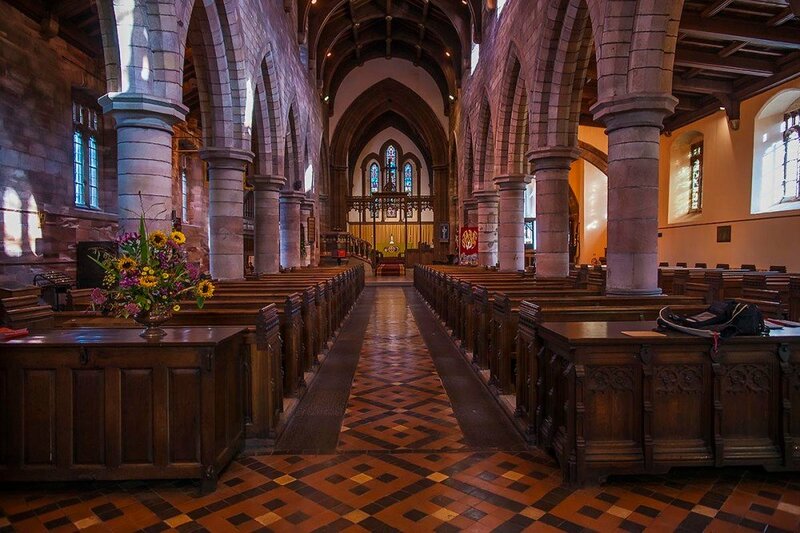 Indeed the place seems to have been prosperous in the 15th century when the south aisle of the church was widened - may be this was the period when the woollen trade, for which Kirkby Stephen became well known, was beginning to expand. In the early 16th century (probably around 1506) there was enough wealth for the fine west tower to be added, with the dramatically tall arch between it and the nave. Things turned bad, though, in the 17th century and the church fell into disrepair: it was not until 1847 that major rebuilding began, with the complete reconstruction of the chancel and the two side chapels (fortunately preserving monuments from earlier times) while in 1871 the nave roof was raised and the present clerestory added. Like most churches, therefore, ours spans many centuries and bears witness to a succession of styles and builders. But as you walk around it, we hope you will also be impressed by its essential unity. Generations of people have cared for it and added their mark, but they have also been respecters of tradition, treating their heritage with love. We try to do the same today.